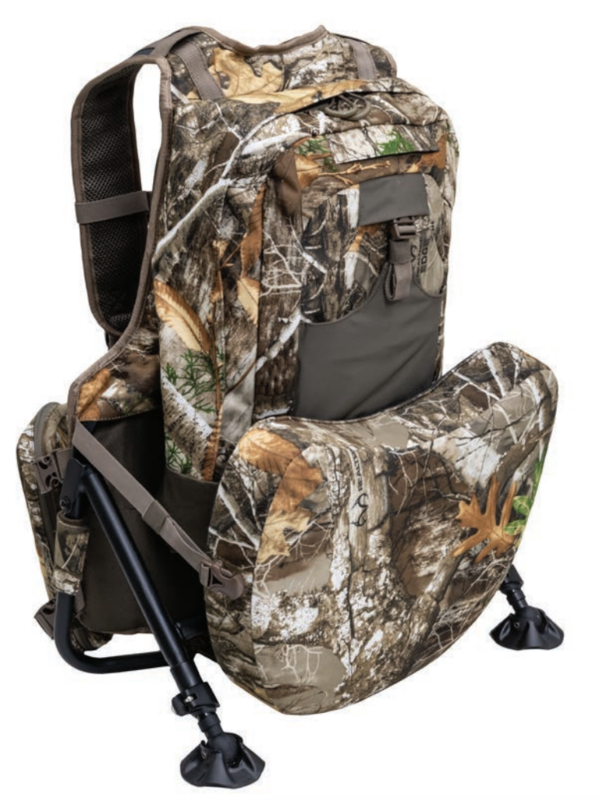 With an integrated foam seat and adjustable kickstand seat, the Enforcer pack from Alps Outdoorz will make long predator sits less of a pain in the rear end. New for 2019, the Alps Outdoorz Enforcer pack was built specifically with predator hunters in mind. Two key features of the Enforcer, the memory foam seat and kickstand frame, make it a welcome addition to any predator hunter’s arsenal. The 3-inch memory foam seat folds up behind the pack and stays out of the way with two compression straps when not in use. The seat lowers into position for a comfortable, warm sit even in the toughest conditions. Like the foam seat, the kickstand frame can be folded up when not in use. Each leg adjusts individually for a firm back rest on uneven ground. Large swivel feet at the base won’t sink into soft ground. The Enforcer wears like a conventional pack with adjustable shoulder harness, sternum strap and waist belt, while a thickly padded back panel with ventilation channels reduces carry strain. In addition to the main compartment and exterior front pockets, the waistband features two large removable pockets that are subdivided with quick-access mesh pockets to stow small items. The left pocket includes a shotgun shell strap that holds six cartridges, while the right pocket shell strap holds 12 centerfire rifle cartridges. Weighing in at 7.3 pounds, the Enforcer is hydration compatible and comes in Realtree Edge.